Hotei (布袋) or Bu-Dai (布袋羅漢 (pinyin:bù dài luó hàn) literally Calico Bag Arhat) is better known in the English-speaking world as the obese Laughing Buddha. In China, he is called Bu-Dai (Wade-Giles Pu-Tai) or Mi Le Fo (彌勒佛) and dubbed the Loving or Friendly One. He has become incorporated into Buddhist & Shinto culture and is based on an eccentric Chinese Chan monk. His image graces many temples, restaurants, and amulets. Hotei has become a deity of contentment and abundance, Taoist in origin. Hotei persists in Japanese folklore as one of the Seven Lucky Gods (Shichi Fukujin). The Laughing Buddha derives from the time of Sakyamuni Buddha, where there was a monk named Angida, who was one of the 18 Arhats of Buddhism. According to legend Angida was a talented Indian snake catcher whose aim was to catch venomous snakes to prevent them from biting passers-by. Angida would also remove the snake’s venomous fangs and release them. Due to his kindness, he was able to attain bodhi. Both Hotei and Angida have similar resemblences, as they both are obese, seen laughing and carry a bag. The image of Hotei is almost always seen carrying a cloth or linen sack, which never empties, and is filled with many precious items, including rice plants (indicating wealth), sweets for children, food, and the woes of the world. Sometimes it can be filled with children, as they are seen as some of those precious items of this world. His duty is patron of the weak, poor and children. In some scenes he may be found sitting on a cart drawn by boys, or wielding a fan called an oogi (said to be a «wish giving» fan — in the distant past, this type of fan was used by the aristocracy to indicate to vassals that their requests would be granted). 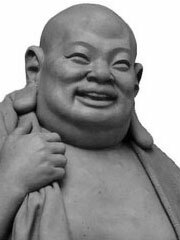 The statue depicts a stout, smiling or laughing bald man in robes with a largely exposed pot belly stomach symbolic for happiness, good luck, and plenitude. The stomach is also considered the seat of the soul in Chinese mythology and so the large stomach can be taken as an allegory for Hotei’s Open Heartedness.Some sculptures have small children at his feet. Another item that is usually seen with the Hotei figure, is a begging bowl; to represent his Buddhist nature. All of these images display Hotei as a wandering monk who goes around and takes the sadness from people of this world. He most certainly is a loving and cheerful character, strikingly similar to Santa Claus in the West, and is a common statuette found in homes and businesses in China and Japan. One belief surrounding the figure of Hotei in popular folklore is that if a person is to rub his belly, it brings forth wealth, good luck, and prosperity. This belief however does not form part of any Buddhist doctrine. He is often admired for his happiness, plenitude, and supposedly wisdom of contentment. Chinese Buddhists have adopted Hotei as the Laughing Buddha into the Mahayana Buddhist pantheon and his image may be found in the first hall of many Buddhist monasteries. Ch’an temples will usually have Hotei located at their entrances & courtyards.Hotei was attributed the title of Maitreya Buddha because of a poem allegedy written on his deathbed that read. (Another Translation reads:Maitreya, True Maitreya. His body takes myriad forms, but at the times he manifest himself to men, none of them recognize (him). Maitreya cult has been established as early as the time of Dao An (314-385). At the time of the Liang Dynasty (502 — 550 CE) the figure of Maitreya was very popular due to political turmoil and a great many Buddhists venerated Maitreya in the hope that he would soon come to spread the dharma. Buddhists at the time took the poem to mean that Hotei had been Maitreya all along and thus the title was attributed to him in popular folklore. Maitreya (as Pu Tai) was the religious figure in many contemporary chinese religion cult from the sixth century as saviour who descend in the time of chaos to cleanse the world from evil and salvage the good. Maitreya is the main figure in sect such as I-Kuan Tao.Most modern Buddhists now view Hotei’s poem as an allegory for seeking one’s salvation in the present moment rather than looking to an imagined future. In Japan, Hotei is also seen as a one of the Shichi Fukujin, the Seven Japanese Shinto-gods of Luck. He is supposedly the only member of the seven based on an actual person. Back when Buddhist missionary monks were delivering the message & way of Gautama Buddha onto the islands of Japan, they devised a method to more efficiently reach the local Shinto inhabitants. By manifesting Buddhist principles, with Shinto Kami, the monks were successful. Kami are seen as Shinto gods and were worshiped as such. The Buddhist monastics were able to better communicate their ideology to Japanese natives by using the Kami’s as examples in common Buddhist practice. Thus, Buddhism became very widely accepted in Japan and from one of these manifestations, came Hotei. Recently, Hotei statues, statuettes and amulets have become relatively well-known in Western cultures. Misconceptions have arisen because of this new enthusiasm, including the false connection made between the Laughing Buddha and Gautama Buddha, the founder of Buddhism.